Gallery of cosmetic make-up and emotional features. Cosmetic corrections of physiognomic features of a female face by means of facial make-up only mask original and valid emotional expressions which in any case are obvious for eyesight of associate people. The open eyebrows seem calm as eyes and mouth express quiet emotions. 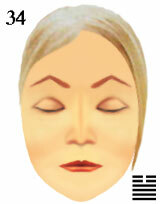 Quiet eyes and mouth can seem outspoken as eyebrows express open emotions. The person feels and sees world around by mentality. The person refuses sensual sensation and desires, but carrying out ideas are not free of reflections about external validity. emotional physiognomic features of female face.